Today's hectic lifestyle can mean liitle time for preparing and cooking healthy, tasty food. All too often meals consist of take aways and ready-prepared dishes that are high in calories and fats and low in nourishment. Food in a Flash has been created to solve this problem. Packed full of fantastic recipes for quick, low calorie and low Point dishes, nothing takes more than 30 minutes to prepare and cook, and some recipes take quite a bit less. It's perfect for those who want to spend more time enjoying their food than making it. As well as dishes for all the family, there are tasty meals for one and two, with a whole section on glorious vegetarian recipes. Puddings and cakes are included too. Every recipe includes Points, calories, preparation and cooking times, and freezing suitability. 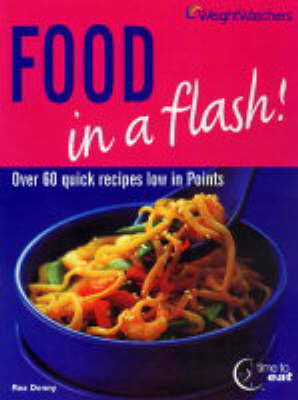 This is an ideal book for all slimmers and anyone with a busy lifestyle.